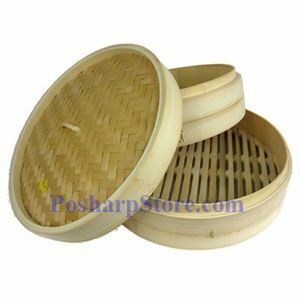 Specially designed for use with a wok, our hand-made bamboo steamer simplifies cooking tender vegetables, rice, seafood and dumplings. Durable bamboo basket for authentic wok steaming. Nestles into a wok for a stable fit; basket should sit 2 – 3 inches above the water. Basket: 12" diam., 4" high. Line Steamer with parchment paper to prevent flavors from steeping into the steamer. Hand-wash in warm water; do not use soap or harsh detergents. Allow to dry thoroughly before storing. Store basket in well ventilated area.